mainstream as well as free improvisation music scenes. He has played and performed in numerous festivals, projects and venues with different musicians from jazz, to traditional Middle Eastern music. Since Saade became active in freely improvised music he has played with musicians such as Wade Matthews, Ernesto Rodrigues, Martin Kuchen, David Stackenas, Michael Zerang and many others. In Lebanon, he regularly participates in the Irtijal festival (the annual free improvised music festival) and numerous other festivals and events throughout the year. 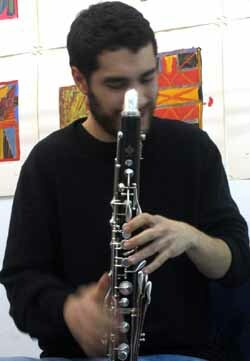 He founded with six other Lebanese musician the first Lebanese ensemble of experimental music "Al Mukhtabar" that plays improvised as well as composed music. Al Mukhtabar Ensemble – a formation that includes Sharif Sehnaoui, Christine Sehanoui, Mazen Kerbaj, Jassem Hindi, Charbel Haber and Raed Yassine – already worked with Gene Coleman, Stephane Rives, Jason Kahn and is constantly inviting many international musicians interested to play with Lebanese musicians. establish a link between this heritage and the forms of development encountered in certain kinds of contemporary music.